Still from USFS video of rockslide above Historic Columbia River Highway in the Gorge. 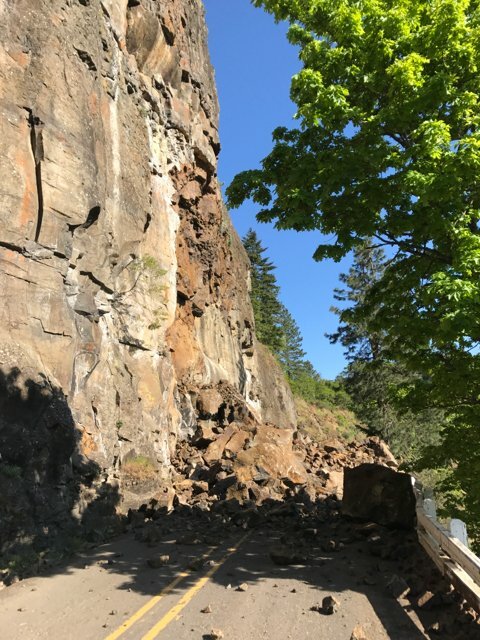 Bummer news from the Oregon Department of Transportation: New rockslides have set back their plans to reopen six miles of the Historic Columbia River Highway that have been closed since last fall due to the Eagle Creek Fire. The slides happened on the section of highway between Bridal Veil and Ainsworth State Park. 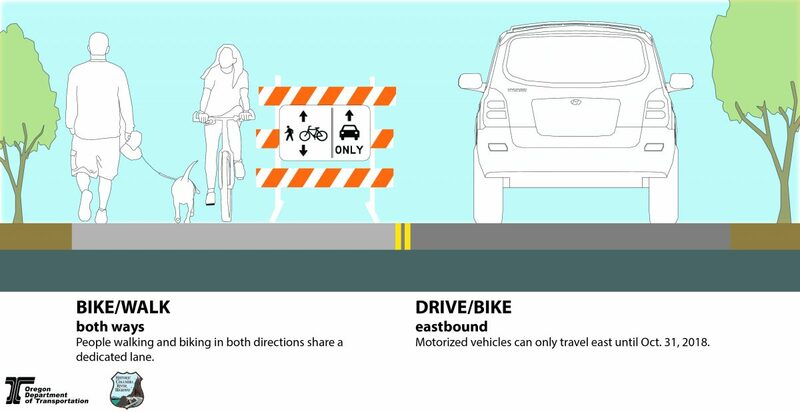 As we reported last month, ODOT hoped to reopen that section of road with an experimental new lane configuration in September. Video (below) of one of the slides near Horsetail Falls, taken by the US Forest Service, shows rocks rolling down a steep hill directly onto the highway. 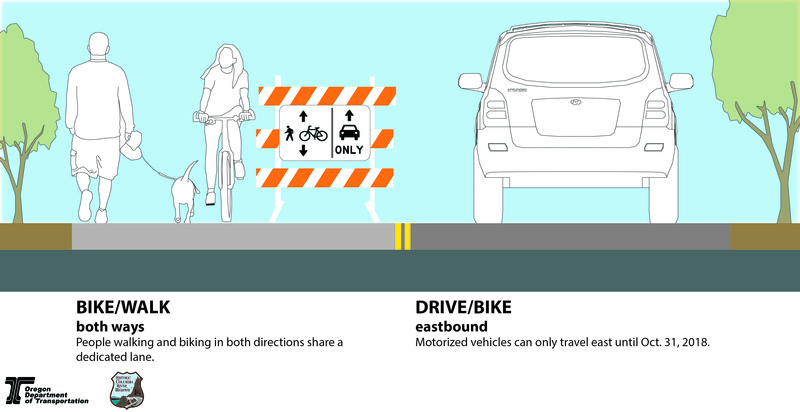 Cross-section of ODOT’s “phased reopening” plan for the Historic Columbia River Highway. They say when a fire strikes a forest it comes back even healthier than before. The same might be true for the Historic Columbia River Highway. When a six-mile section of the scenic road reopens this fall following a one-year closure due to the Eagle Creek Fire, the Oregon Department of Transportation says it’ll have one fewer lane for automobile users. Referred to as the “phased reopening” plan, ODOT will limit automobile use to one lane in the eastbound direction for a five mile section between the Benson State Recreation Area/Hartman Pond (Exit 30) and Ainsworth State Park (Exit 35). The westbound lane will be set aside for walking, rolling, and emergency vehicles (see map graphic below). UPDATE: This post has been edited to reflect the fact that the State of Oregon has not technically “closed” the gorge to bicycling. People on bikes are still allowed to use I-84 (legally, from NE 238th east); but should be advised of work zone conditions. We regret any confusion the initial story caused. The combination of fire clean-up and construction of new paths (ironically) adjacent I-84 has led to a decision to prohibit bicycling warnings for bicycle users through a key segment of the Columbia River Gorge this summer. 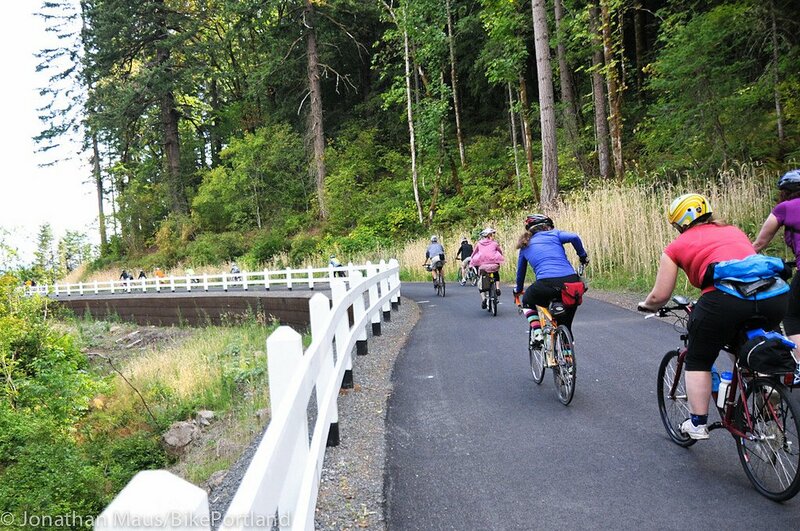 Imagine a carfree Historic Columbia River Highway… like Dave Wechner did almost 30 years ago. 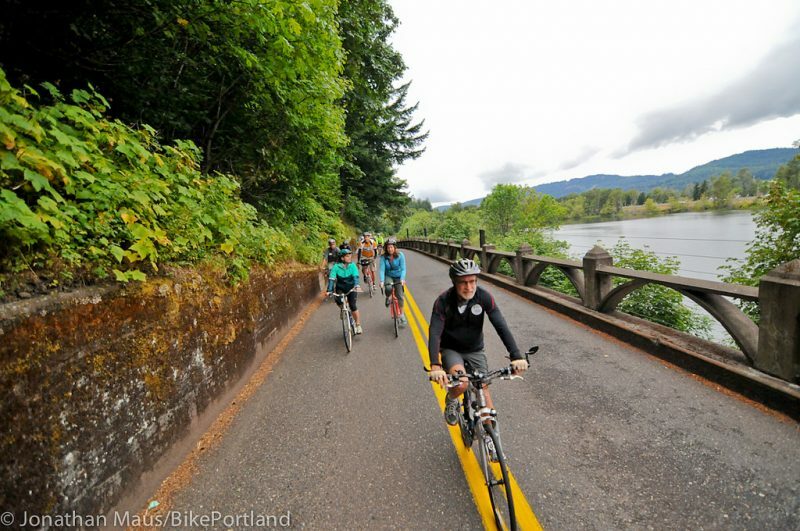 There’s been a steady trickle of news here on BikePortland in recent years from agencies and advocates who see a future for carfree traveling in the Columbia River Gorge. But it turns out the idea isn’t as futuristic as you might think. As of October 11, according to the Eagle Creek Fire Incident managers, the fire has burned 48,831 acres and is 50 percent contained. Cooler temperatures and rain will help reduce the potential for significant fire activity. The uncontained portion of the fire is in steep, inaccessible terrain and fire managers do not anticipate the wildfire will spread in these areas. Falling trees and rocks punched through wooden railings and decorative rail along the Historic Highway. Rocks of varying sizes slid down slopes and off of steep hillsides. In many places, the rocks and trees line that the road and those in the distance are charred and likely weakened. The fire removed vegetation, underbrush and tree roots that support the Columbia Gorge. We expect to see land and rock slides with additional rain. ODOT crews and hired contractors continue to remove trees in danger of falling into the roadway, scale slopes to remove debris and rocks, and inspect structures. The Historic Highway will remain closed until hazards have been removed and it is safe to open. 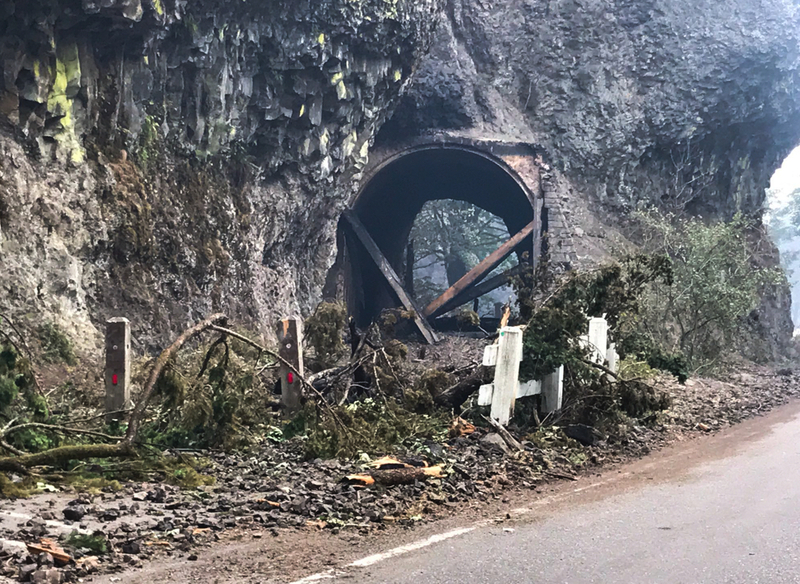 The wood lining and portal timbers inside of the Oneonta Tunnel caught fire, and there are concerns about heat-related damage to the structural shotcrete under the wood. The bluffs on either side of the tunnel continue to drop rocks, and our engineers have been unable to safely determine any additional structural damage. Once we are able to safely access the inside of the structure and determine what restoration is needed, we will determine the cost to rehabilitate the wood and any additional damage and pursue funding to restore the tunnel. 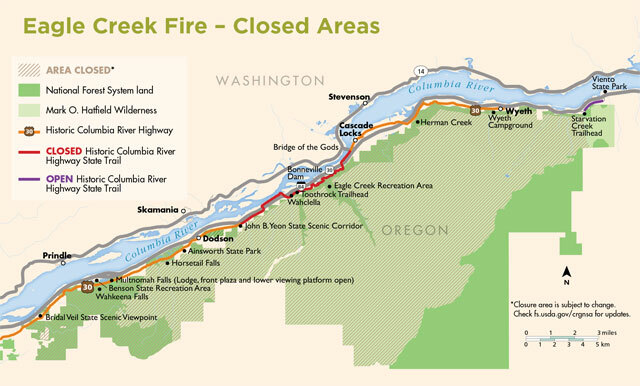 Thank you for continuing to stay off the Historic Columbia River Highway and State Trail, as well as all the trails closed due to the Eagle Creek Fire. The beautiful Oneonta Tunnel that just re-opened to biking and walking in 2009 isn’t looking so good right now. The Eagle Creek Fire is still raging in the Gorge and we’ve been reaching out to sources to find out how much impact it has had on the Historic Columbia River Highway and State Trail. Just one year ago we joined a big group of riders and dignitaries for a triumphant centennial celebration of the legendary road. And today it feels like it’ll be another hundred years before things are back to normal. The good news is not all has been lost. Reports yesterday from fire officials were heartening. But what about those pictures of our dear Oneonta Tunnel engulfed in flames?! We’ve been as eager as you to know more. Riders on the Historic Columbia River State Trail. Last week we posted a story about how electric bicycles have opened up new riding opportunities in the Columbia River Gorge. But it turns out it’s illegal to ride an e-bike on the Historic Columbia River State Trail — or on any other paved bike path within the Oregon State Parks system. 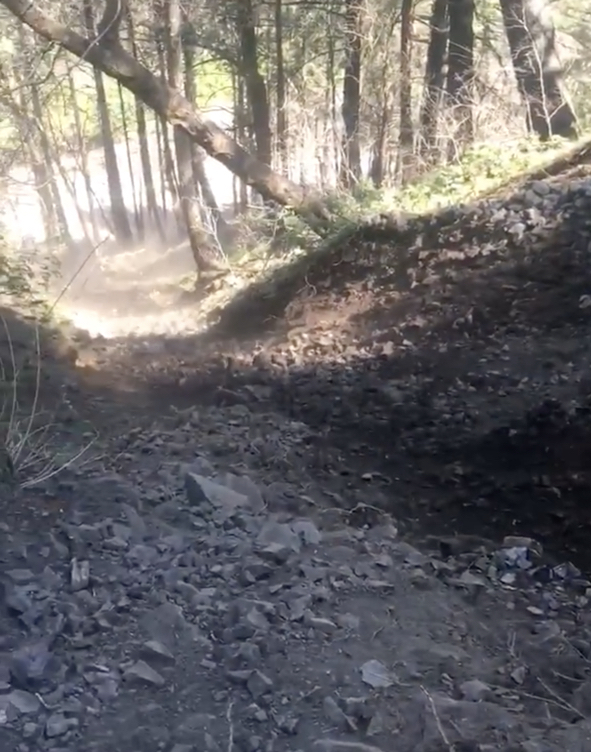 We’ve since updated that story with a note after learning about the issue from a commenter (Park Chambers, who happens to own Fat Tire Farm and Hood River Bikes) and then confirming the facts in a phone call with an Oregon State Parks spokesperson. This prohibition of e-bikes on paved trails caught me off-guard. As pedal-assisted bikes gain in popularity, I think the issue merits a closer look. Yikes! ODOT says it could be up to three weeks before the road opens. A major rock slide has closed a popular bicycling route just east of the Rowena Curves overlook on the Historic Columbia River Highway (US 30). It happened Sunday evening and there were no injuries. The Rowena Curves are between Hood River and The Dalles. 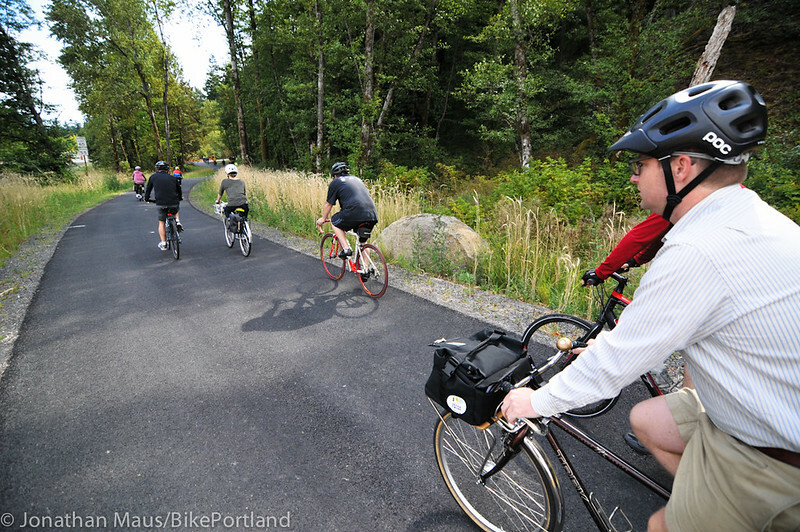 The Oregon Department of Transportation has inched ever closer to its goal of reconnecting a 75-mile paved path and low-volume road between Troutdale and The Dalles. Their Historic Columbia River Highway State Trail project just won a $28 million grant from the US Department of Transportation for the Mitchell Point Crossing.